This cheerful aromatherapy set is a favorite among oil users! ✔ Sweet Orange Essential oil has a wide variety of uses. Domestically, it is used to add orange flavor to beverages, desserts and sweetmeats. Industrially, it is used in soaps, creams, anti-aging and wrinkle-lifting applications, Air fresheners & deodorants. Medicinally, It serves as a detoxifier, boosts immunity, treats constipation and dyspepsia. It is also very good for maintaining healthy, smooth and glamorous skin. ✔ Lemon Essential Oil has been historically recognized as a cleanser. It is reputed as being antiseptic, and as having refreshing and cooling properties. On skin and hair it can be used for its cleansing effect, as well as for treating cuts and boils. Research has also shown Lemon Essential Oil to enhance the ability to concentrate. ✔ Lime Essential Oil has a crisp, refreshing citrus scent that has been used by Aromatherapists for its uplifting and revitalizing properties. It can also act as an astringent on skin where it is reputed to help clear oily skin. ✔ Grapefruit Essential Oil is known to be a spiritual up-lifter, and to ease muscle fatigue and stiffness. It is also a purifier of congested, oily and acne prone skin and is sometimes added to creams and lotions as a natural toner and cellulite treatment.Grapefruit Essential Oil is reputed to ease nervous exhaustion and relieve depression. ✔ Tangerine essential oil is effective at treating various skin issues such as oily skin, healing scars, stretch marks, and acne. It also boosts the immune system by stimulating the lymph glands. It is a potent antioxidant and reduces signs of inflammation. It has an uplifting olfactory quality which helps mild cases of depression when diffused throughout the air. Energizing, refreshing, and Pure perfection is what you will get with our Citrus Essential Oils Set! 100% PURE THERAPEUTIC GRADE. Our Premium Citrus Essential Oil Kit contains the best of the fruity essential oils. Included you get Lemon, Orange, Grapefruit, Lime, Tangerine & Mandarin Essential Oils, All Pure and Undiluted. PREMIUM QUALITY. ALL OUR ESSENTIAL OILS ARE 100% PURE & NATURAL THERAPEUTIC GRADE. NO ADDED INGREDIENTS WE NEVER SACRIFICE QUALITY FOR PRICE. "ABSOLUTELY NO" SYNTHETICS, CHEMICALS, CARRIER or BASES ADDED. This makes our oils the most AMAZING SMELLING essential oil on the market. Our citrus essential oils are cold pressed for maximum efficacy. Distillation facility is GMP, FDA, ISO 9001 and Kosher certified. Make sure ALL oils you buy have these qualifications! CITRUS BURST - This set includes the very best oils needed to boost and energize. Use them individually for their unique power, or create your own beautiful smelling blends! Contact us for loads of blend recipes and ideas. 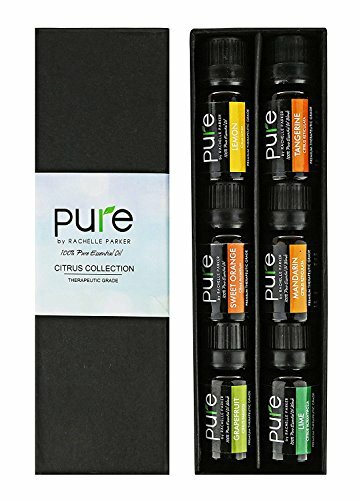 BEST VALUE GIFT SET - All of Rachelle Parker Essential Oil gift sets come beautifully packaged as shown in the listing pictures and make a fantastic gift for any occasion. SATISFACTION GUARANTEED - 100% GUARANTEE - Purchase with complete peace of mind, we are confident that our oils are by far the highest quality and most effective on the market. If you have any questions about this product by Pure by Rachelle Parker, contact us by completing and submitting the form below. If you are looking for a specif part number, please include it with your message.